The project will include 473 hotel rooms and 100 resi units for the property named after the Doors frontman. 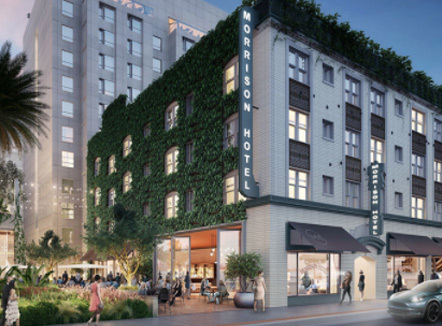 Relevant Group’s plans to redevelop the 104-year-old Morrison Hotel in South Park just got bigger. The Hollywood-based real estate investment company wants to develop a 12-story building next to the existing hotel, which it will redevelop. The company filed plans with the city Monday, which calls for the new building rising on what is now a parking lot at Hope Street and West Pico Boulevard, Urbanize reported. The project would include 100 residential units and 473 hotel rooms. The initial overhaul plans announced in August called for 245 hotel rooms. In total, the project will be 388,000 square feet. At the time, the Downtown News reported that the hotel would charge $300 per night for a room. The Morrison Hotel has historically been a single-room occupancy establishment, offering low-price lodging on a long-term basis. Managing Partner Grant King told the News it would be an “ode” to Doors frontman Jim Morrison, whose band took a photo at the hotel for the cover of their 1970 album Morrison Hotel there.